Today I’ll highlight a couple of unusual methods that people are using to get between the government and its claims on peoples’ money. First, here’s a recent profile of Father Louis Vitale, an American Franciscan friar who has been arrested hundreds of times in civil disobedience actions of one sort or another. Outside court, Vitale admonishes friends and family members not to pay [the fine]. He would rather go to jail. When DeChristopher entered the building, officials mistook him for a bidder and allowed him to enter the auction, where he was given a bidding paddle — number 70. The University of Utah economics student says he stood out in a room filled mostly with veteran oil and gas men, but he started holding up his paddle to bid. By the time officials caught on and stopped the auction, DeChristopher had acquired the rights to 12 parcels of land, totaling 22,000 acres — for $1.79 million that he didn’t have. DeChristopher’s motives were environmentalist, but his methods worked not just to disrupt the oil & gas companies’ intended use of the land for resource extraction, but also to disrupt the government’s revenue-raising exploitation of the land. He’s facing federal criminal charges for his action, but he’s confident that the government will have a hard time proving any real damages — the Bush Administration tried to sneak the auction in without following the rules, and it has since been legally invalidated. A diarist at Daily Kos has written up a splendid commentary on the issue of bloated military spending that covers all the angles — well, except the angle of how individuals can stop their contributions to the problem (but I’ll try to pick up the slack). Though national political figures have tried to coopt the movement, many of these modern-day tax protestors are citizens who largely reject both the major political parties. Many demonstrators are interested in expressing their disapproval of decades of federal government fiscal irresponsibility and unfair, intrusive policies. These policies have impoverished us. They include needless foreign military interventions, corporate bailouts and the socializing of private business losses. These protesters reject policies that provide taxpayer subsidies to industry and special interests, they rebel against excessive and unfair spending and decry gross monetary expansions that cause insidious tax inflation. They warn of deficit spending that promises to leave a crushing debt to future generations, and call for an end to the borrowing, printing, spending, taxing and regulating policies that have caused our current economic suffering. Some dismiss as selfish anyone who considers tax rates too high or who disapproves of certain government spending. Some believe in government taking on a larger role in our lives and see high taxes as something that responsible and fair-minded citizens should pay happily. But for those who recognize that excessive taxation robs many of their ability to pay for the needs of their families, the tea party provides an appropriate outlet for their frustrations. These demonstrators are in good historical company. It seems right to join them. 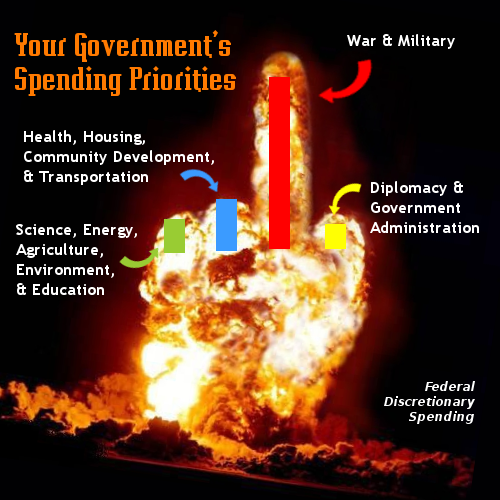 The War Resisters League says that 47% of the federal budget is military spending. The government says that only 16% of its budget goes to national defense. Who’s right?